The Directories - Faker plugin lets you generate dummy content for your directory. You can generate not only listings or reviews but also categories, locations, and tags. 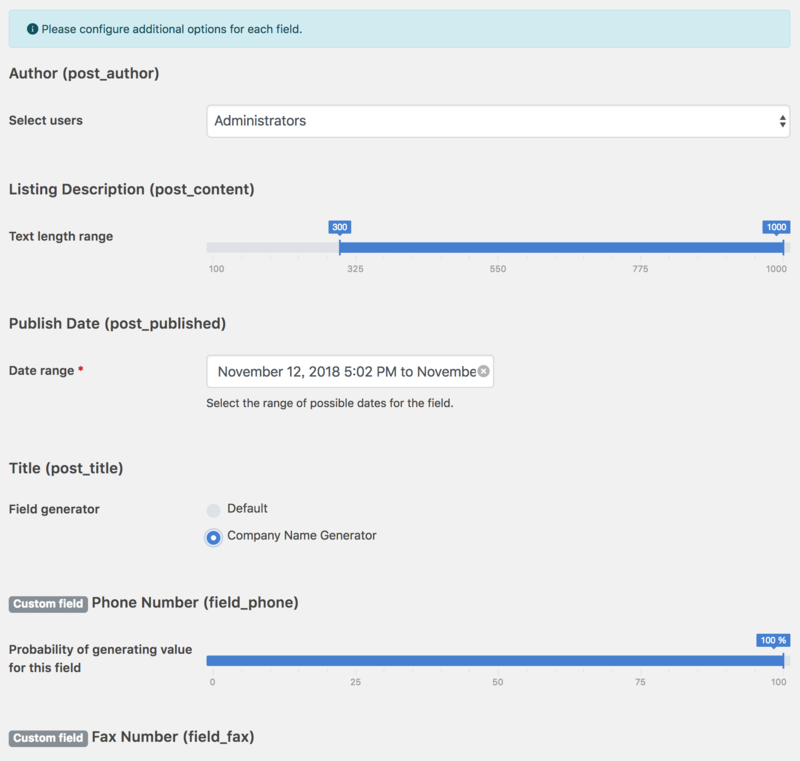 It also lets you generate content for any custom field. It is a useful tool for you to quickly preview how your directory looks like with actual content. Click Browse... and then locate the directories-faker-x.x.x.zip (where x.x.x represents the version number) file saved on your computer. If you do not have the file, you can download the package from https://codecanyon.net/downloads. Now that you are ready to generate dummy content, follow the steps below to generate listings for your directory. If your directory currently does not have categories, locations, and/or tags setup, you can do so by importing demo content available. Note: We will use the demo content included with Directories Pro instead of generating them for more realistic data. Select Categories (or Locations or Tags) under your directory menu in the admin sidebar. Click the Import button at the top of the page. 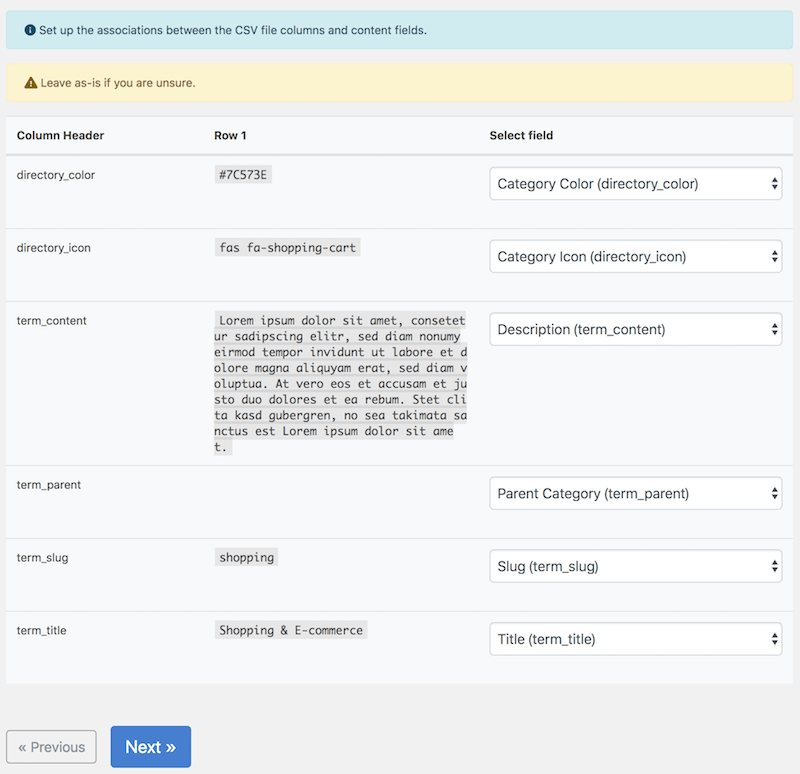 Select Select from existing CSV files for CSV File and then select Demo categories (or Demo locations for locations or Demo tags for tags) and then click Next. Select the fields to import. You can leave the settings as-is and click Next. Configure fields to import. You can leave the settings as-is and click Next. Number of records to process per request - The import process is triggered through AJAX requests. Set the number of content items that are imported in each request. If you are unsure, leave it as-is. When you are ready, click Import Now. You will see a real-time progress of what is imported and, if any, failed. Click the Generate button at the top of the page. Select the fields to generate by checking the checkboxes. If you are unsure, it is usually safe to leave them as-is. Press Next to proceed to the next step. Depending on the fields selected, additional settings that can be configured before generating listings are displayed. Default - Generates random phrases and set them as the listing title. Company Name Generator - Generates fake company names and set them as the listing title. Default - Choose photos to be used as listing photos from the WordPress media manager. Picsum Photo Generator - Downloads royalty free photos from https://picsum.photos/ and use them as listing photos. Random - Randomly fetch locations setup in your directory and generate lat/lng corrdinates within the proximity of those locations. Recommended if you already have locations setup int your directory. Enter new location - Enter a location address (e.g. USA, California, Tokyo, etc. ), which will be then used to generate lat/lng coordinates around that area. Select manually - Manually select one or more locations from locations setup in your directory and generate lat/lng corrdinates within the proximity of those locations. Note: Any of the options above require a valid geocoding provider configured in the map settings (see Configure Map Libraries) if you wish to automatically fetch lat/lng coordinates for each location generated. Reverse geocode lat/lng coordinates generated for each item - Whether or not to use the geocoding API to fetch a real address for lat/lng coordinates generated for each listing. Requires a valid geocoding provider configured in the map settings (see Configure Map Libraries). If you are unsure about these settings, it is usually safe to leave them as-is. Number of item to generate - Enter the number of listings to generate. Number of records to process per request - The generation process is triggered through AJAX requests. 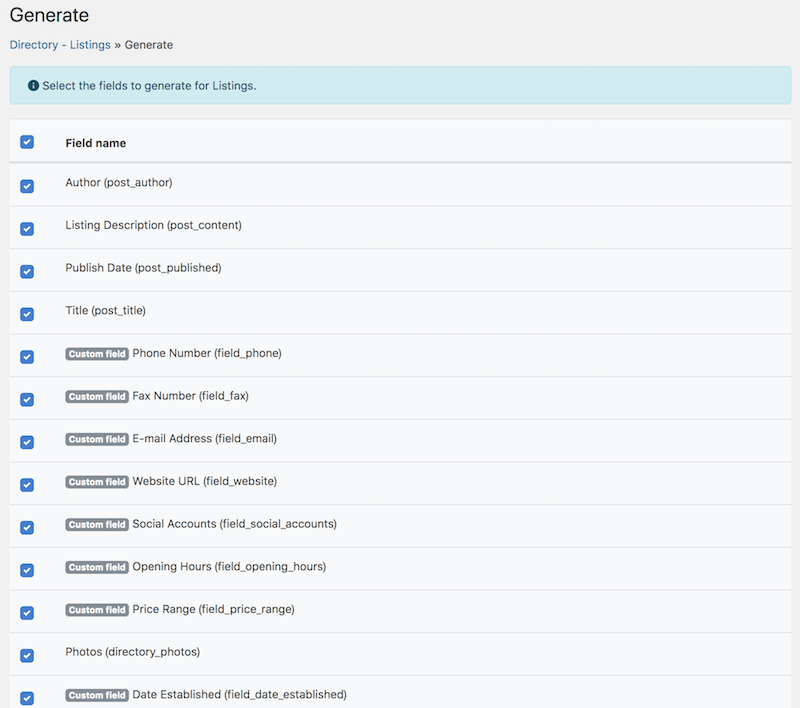 Set the number of listings that are generated in each request. If you are unsure, leave it as-is. When you are ready, click Generate Now. Now, sit back and relax. You will see a real-time progress of what is generated and, if any, failed. This may take a while (up to several minutes per request) to complete, depending on the fields that you selected to generate and the settings of each field.